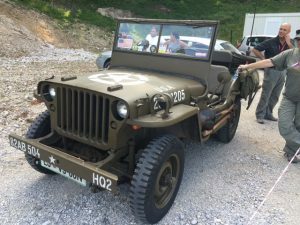 This WW2 Willy’s Jeep was totally original down to the tools hanging off the side. 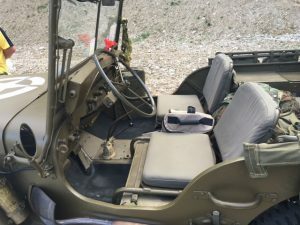 The 1997 P2P was actually won by a Willy’s Jeep though looking at the seats it can’t have been a comfortable experience. This one was alongside the queue for the 6th and final stage of the day – the 5th having been another lovely 12km narrow, curvy and dippy tarmac stretch on closed roads through fields and villages. Unfortunately the danger element reappeared. We were waiting for the stage to start, which gave us time to chat to the Jeep’s owner, as we had heard there was a delay because a car had gone off the track. As I have mentioned this is not an unusual occurrence but the sound of the ambulance siren coming back down the track ended what had been a lovely day on a more sober note. Despite the gossip which spreads like wildfire – remember the Rolls Royce reduced to ashes in Mongolia and now very much with us in one piece in Europe – there is little news other than the fact that one of the Bentleys (that’s 2 Bentleys in one day) went off the slippery gravel. Navigator is shaken but unhurt but the driver is in hospital for tests but apparently in very good hands. The stage was cancelled and we filed in unusually orderly and pensive fashion to Ljubljana and the hotel. Everyone talks a good story about protecting the cars so that they get to Paris under their own steam but not all are actually doing so and while the leader of the Classic section is some 39 minutes clear, second to fourth are separated by under 2 minutes (third and fourth by only 5 seconds) after 10,000km. The days are long as outright mileage is replaced by 5 or 6 timed stages every day and having one at 5.30pm after 9 hours on the road is maybe not such a good idea. Tomorrow it all starts again and I am sure that the games will continue until the end.